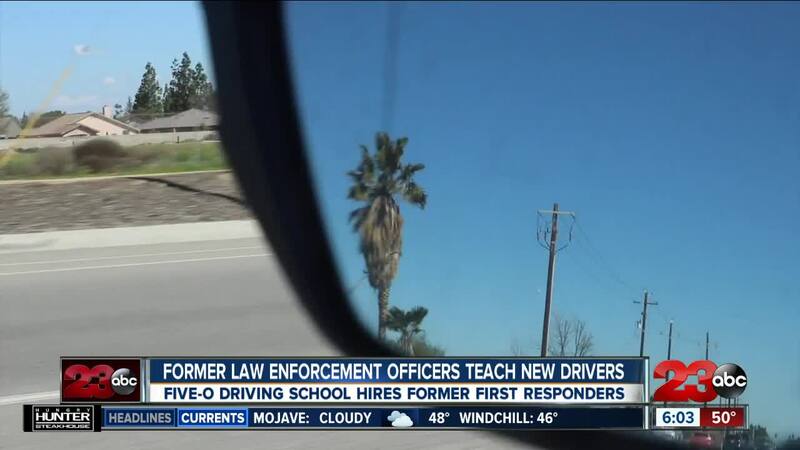 BAKERSFIELD, Calif. — After careers in law enforcement, James Barnard and John Rhoades recruited other former officers to teach new drivers in Kern County the rules of the road. Five O driving school employs instructors that have once served as first responders. “Instructors from the Bakersfield Police Department, the California Highway Patrol, the Kern County Sheriff’s Department and they have all been on accidents," said Barnard. "They have been on fatality accidents where they have seen loved ones come to the accident scenes and they are devastated." Through Five O Driving School, Barnard hopes the accidents he's seen won't be in vain. “If we could prevent one accident at our school, that is our goal,” said Barnard. Mark Rhoads is an instructor at Five O Driving School after 34 years with California Highway Patrol. He says in his career, he's picked up on mistakes that he can now address with student drivers first-hand. “Some of the things that I teach them may help them out down the road keep them from having an accident that I have seen happen,” said Rhoads. To learn more about Five O driving school, visit their website.